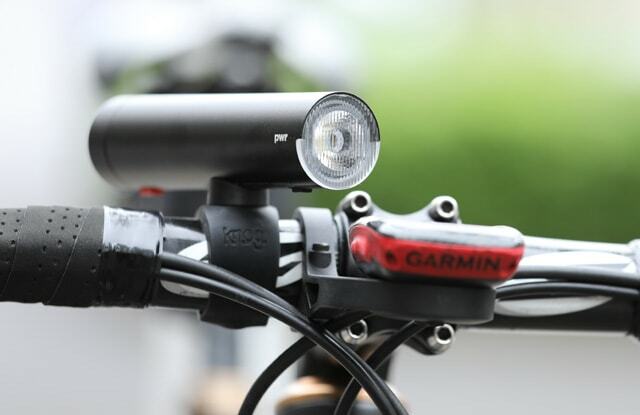 The Knog PWR Rider is one of Knog’s PWR series of bike lights and certainly one of their top products. Knog is an Australian-based company launched in 2003. The company has been around for more than a decade but the new PWR lights just entered the market recently towards the end of 2017. Programmable Modes. The ModeMaker app allows you to program and customize the light modes, adjusting its brightness or controlling its runtimes. Rechargeable Power Bank. The Knog PWR Rider includes a 2200 mAh capacity power bank for you to recharge your other electronics devices. A very unique feature! Elliptical Beam. 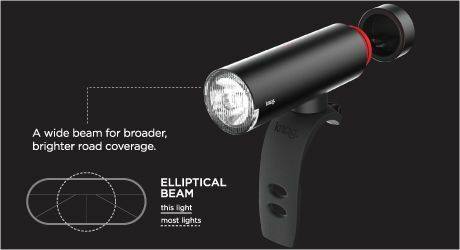 The Knog PWR Rider uses an elliptical beam for a wider light coverage in front of you. This gives you the ability to see a broader road coverage especially during the night. 450 Lumens. Remember, lumens determines how bright a light can be. With that in mind, this headlight has a capacity of 450 lumens, which is good enough for you to see the road after the sun has set. 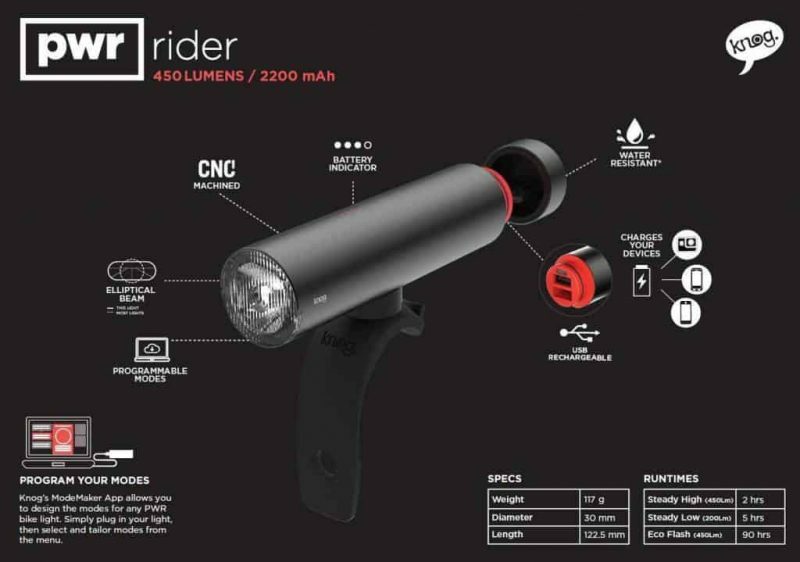 The Knog PWR Rider uses a single LED light to power all of its 450 lumens. While other headlights only put light in one spot, this one features an additional elliptical beam. The combination of these 2 types of beams not only gives you a broader coverage but also an intense bright spot right in front of you. The Knog PWR Rider comes with only one button, but yet it does many things. To turn the light on or off, simply press and hold the button until it opens/closes. To switch its modes, make a short press and the light will change modes. On top of that, you can easily program the headlight to suit your riding needs. Simply plug it into a computer and the ModeMaker app will show you a bunch of selections for you to manage and customise. The Knog PWR Rider is made from high quality materials like the other Knog products. So you can be rest assured that you’ll get exactly what you’re paying for. The body is made of premium grade metal, machine anodized aluminum along with a ridged head stick. These materials make the headlight more durable and less likely to rust. While some companies like to make variety of products to sell, Knog settles for simple yet slick black cylinders. 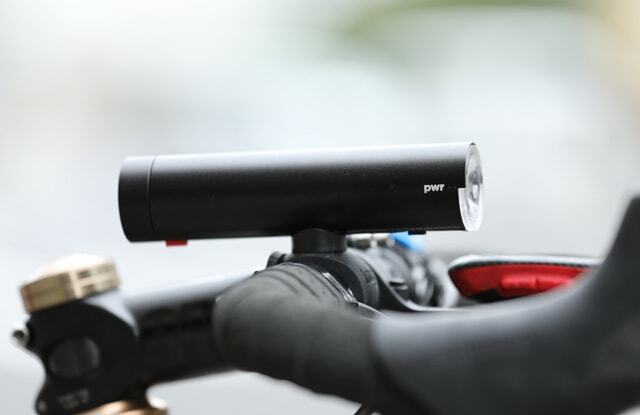 The Knog PWR Rider has a size of 122.5 mm x 30mm, which is a decent size as it lies parallel to the bar. Though it’s slightly larger than its rivals, its powerbank charging feature makes up for the slight difference. And weighing at 115g, the Knog PWR Rider is slightly lighter than its rivals, taking into consideration that it has a power bank built into it. If you use the Knog PWR Rider at its maximum power (450 lumens), the battery can last about 2 hours. However, if you want to prolong their battery life before recharging, it features an eco-flash mode that can last for 90 hours at 250 lumens. The charging time for the Knog PWR Rider is also fairly quick and takes only 5 hours to reach 100%. Another handy feature is the 4 LED indicators that signal how much battery life your headlight has remaining. The Knog PWR Rider includes a power bank with a capacity of 2200 mAH. There are 2 USB ports available; a micro USB port for charging and another USB Type-A port for you to plug in the cables to charge your electronic devices. As a reference, the Knog PWR Rider can run at 450 lumens for 1 hour and charge the iPhone7 from 0% to 35% simultaneously before the power bank runs out of juice. Mounting the Knog PWR Rider is easy and straightforward as there are no tools involves. Right out from the box, you’ll have a silicone strap that runs over your handlebar and voila, that’s it. It will fit handlebars of all sizes, as well as aero handlebars. The silicone strap looks to be prone to breaking over a long period stretching and use. So use caution when mounting the lights. With the Knog PWR Rider, you can be assured that you’re getting quality products. It stands out among its rivals not only in its built quality but more importantly the 2-in-1 powerbank / bike headlight function. 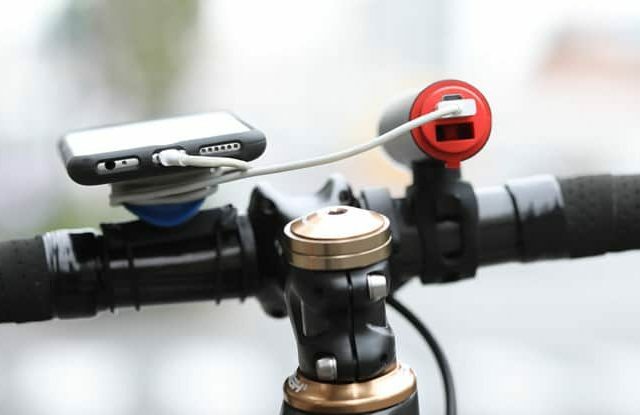 Most cyclists can easily relate to you a time where either their smartphones or Garmins run out of battery mid-ride and the hassle to have to carry a separate powerbank to charge them. If that’s you, then I would recommend the Knog PWR Rider as it helps to kill 2 birds with 1 stone. 1. Who is the Knog PWR Rider aimed for? With it’s 2-in-1 function, the headlight is designed for commuters in mind. You can charge your phone/GPS and use the headlight simultaneously. Knog offers a 2-year warranty for defective hardware, software faults and manufacturing defects. You can check Knog’s website for more info. 3. Are there other options I can consider besides the Knog PWR Rider? I’ve listed bike headlight options you can consider here.